boAt lifestyle has expanded its product portfolio by launching it’s Alexa powered smart speaker. boAt Lifestyle is known for its intricate audio engineering, supreme comfort, exquisite designs and best in class audio quality products. It brings music to your daily routine in a seamless manner, with top notch sound quality and a user experience like none other. The boAt Stone 700A is colorful, intricately made and yet absolutely idiot proof making it hard to damage externally. It is also IPX 6 Water Resistant, making it the perfect poolside accessory. The speaker has 1.75” * 2 Full Range Drivers that pump out a Power Output of 10W RMS bringing the sound of a lifetime with HD Clarity that integrates into pure audio bliss and is the perfect way to start your day with Alexa. The Bluetooth V4.2 enhances wireless connectivity up to 10 meters, and it has an Aux wire for dual connectivity. 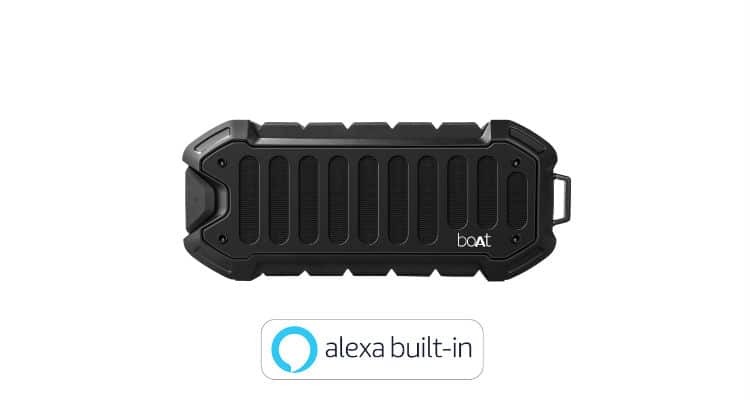 One can use the smart Alexa button on the speaker itself or the boAt Nirvana App to use Alexa . For access to full functionality, one can register using the Amazon Alexa app to make the experience even better. The price of the product boAt Stone 700A is available at an introductry price of Rs 3199. The product carry’s a 1 year warranty and is available at Amazon.in.